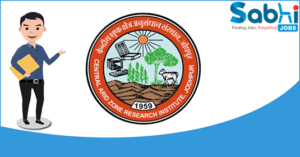 CAZRI recruitment 2018 notification has been released on official website www.cazri.res.in for the recruitment of Project Associate, Junior Research Fellow Vacancies. Walk-in-Interview 23rd May 2018. Here on this page you will get the details like the Name of vacancies released by CAZRI with exact number of posts. Some other criteria like Education details, application fee and way to apply application for CAZRI recruitment 2018. Educational Qualification: M.Sc. Agricultural Sciences (Agronomy/Soil Sciences/ Plant Breeding) or M,Tech in Soil & Water Conservations Engineering/ Biotechnology for S.no-1. M.Sc. Basic Sciences (Botany / Biotechnology)having NET qualification for S.no-2. Interested and eligible aspirants may attend for walk-in-interview along with original certificates in proof of age, educational qualifications, experience, driving license etc. at the time of Interview. Venue of Interview:- At the office of CAZRI, Regional Research Station, Kukma, Bhuj-370105 (Gujarat).